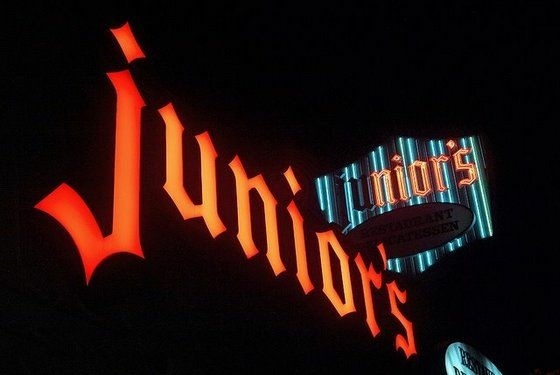 The sign for Junior's Deli in Westwood, Calif. lit up at night. Finding a real Ruben sandwich next year in L.A. is about to get a little harder. Junior's Deli, a Westside institution, is closing its doors today. For 53 years it's been serving coronary inducing Jewish deli food to everyone from Hollywood stars to retirees. KPCC's Ben Bergman dropped by this morning.